Bed bugs come out of hiding at night to feed on the blood of those resting nearby. They inject a local anesthesia that numbs the skin so that its bite is painless. This means that its victim can sleep through the night and is usually unaware of having been bitten until later. People react differently to bed bug bites. 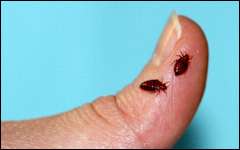 The reaction depends on the individual’s immune reaction to the bed bug’s saliva. Examine the mattress and box spring. Lift up all the blankets and sheets. The bugs themselves are wingless, oval-shaped insects that are about one-quarter inch in size. If they have not had a meal for a while, they are flat and brownish in color. After feeding on blood, they become red and swollen. There may also pinprick-size drops of blood or tiny blackish dropping. Be sure to check underneath the mattress buttons, seams, crevices, and the area between the box spring and the headboard, or the box spring and any wood or metal. Bed bugs may appear in the finest hotels luxury suites so don’t be comforted merely by the price you paid. Should you find evidence of bedbugs, don’t be shy about requesting another room on another floor.